NEW YORK - A New York City postal carrier is accused of failing to deliver more than 40,000 pieces of mail, some dating to 2005. According to a federal court complaint, Joseph Brucato hoarded the mail at his home, car and post office locker. He was arrested Wednesday after a supervisor noticed undelivered mail piled up in Brucato's personal vehicle. Magistrate Vera Scanlon ordered him to "abstain from excessive alcohol consumption." Brucato's attorney says his client suffered from depression and there were days he simply couldn't walk the route, CBS New York's radio affiliate 1010 WINS reports. 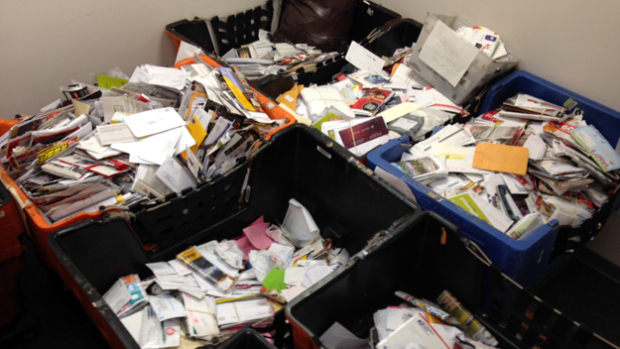 Authorities say about 2,500 pounds of U.S. mail postmarked as far back as 2005 was recovered. Brucato's route included businesses and residences in Brooklyn's Flatbush section. Neighbors of Brucato told 1010 WINS they hope the courts are lenient. "You know, hardened criminals are one thing, you know something like this, who did he hurt?" one neighbor said. "He's going to lose his pension most likely, his reputation is gone. Another added: "Just leave him alone, he's a nice guy." Brucato has reportedly been suspended without pay. A spokeswoman for the postal service wouldn't say how long it would take to deliver the stashed mail, according to the station.